Titan Attacks is a fun little game by a British Indie developer that’s perfect for quick blasts on the go. 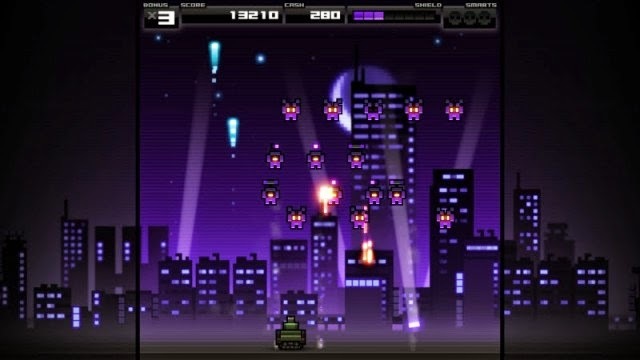 The gameplay will remind you of Space Invaders, you control a tank which can move left and right along the bottom of the screen and above you are attacking aliens who move left and right slowly progressing down the screen towards you, firing shots while they move. The idea is simple; destroy them all by firing your tanks weapon before they destroy you. This simple idea leads to some addictive gameplay as you rack up points and earn money to buy upgrades and supplies. As you complete each stage without taking a hit you also earn a multiplier, which keeps increasing with each stage you clear until you take damage, which resets the multiplier. Destroying the attacking aliens involves some precise timing as you need to ensure your bullet hits them as they move and you also need to keep an eye there bullets coming towards you so you can move out of the way. During the levels ships which drop bonus points and supplies will fly across the top of the map and you need to prioritise shooting them so you can claim there rewards. At the end of each stage you can spend the money you’ve earned on more shields, a more powerful gun or new weapons that give you the edge in the next battle. The graphics are simple and colourful and the background changes as you progress through the stages. The soundtrack keeps you focused with its retro style beats. There’s a leaderboard where you can compare your scores against the world and your friends to see how you stack up. Overall this game is great fun and really addictive and for £7.99 you get the PS3, PS4 and PS Vita versions so there’s really no reason not to try it.